Eleven year old John Watson has just moved to a New York apartment with his military mum to live a stable, civilian life. He misses his estranged father and life is boring. He meets Shelby Holmes and her dog, Sir Arthur. Shelby is a tetchy but sparky little girl that lives in the same apartment block. She’s highly intelligent, independent and nosy. 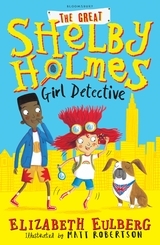 She is an unofficial girl detective, highly regarded in the neighbourhood. Younger than John, and a loner, her dedicated passion is solving crimes. Shelby is called in to investigate the disappearance of Daisy, a show dog owned by the wealthy Lacy family. John, now called Watson, is allowed to tag along on her jaunts so he can familiarize himself with the neighbourhood. Watson is eager to make friends but Shelby has made it clear friendship between them is not an option. Watson finds himself accompanying Shelby in all her explorations. His loneliness abates as new thoughts occupy his mind. He begins to observe and think like a sleuth due to Shelby’s demands. The neighbourhood becomes less alien. There are lots of suspects, especially in the Lacy household. Is it Emerson the dog trainer? Or perhaps Daisy’s owner, Tamra? Even Tamra’s jealous sister Zareen and her twin brother Zane are suspects! Can Shelby and Watson crack the case before the dog show that’s only a few days away? Will solving the case together mean things will improve between the two sleuths? In this character driven mystery story about unusual friendships, we discover that there’s more to children that we see. They are smart and have hidden talents that if nurtured, can become their life’s true calling. Themes around strength of character, courage, adapting to new circumstances, and self confidence weave through a strong simple storyline.